Sizzling Tastebuds: My Mother's kitchen # 2 : Indian Mithai Mela - send in your sinfully sweet entries..
Add to my blog events page.. Will try to send something. 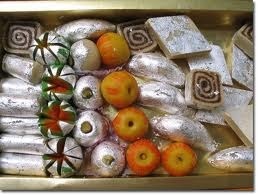 I have loads of mithai at my space waiting for such event, but all r archived, let me know how many i can linked. have linked my mushroom burger to ur event. I have a few recipes which I will email you. Will send in my entries soon. Nice one Kalyani .. Happy hosting. @ Safrronstreaks - got the entries for Indian Mithais but not the burger.. do resend..
you are hosting a wonderful event dear! sory for late post on food blog news! was busy all these days! Just came across your blog today and following you.... do visit my blog FOOD MAZAA. hello dear...nice and sweet event..
happy hosting..eager to c all mithai collection in a page..
Will definitely love to send in my entries too.....thanks Kalyani for hosting this event. I have a couple of sweets that have been waiting for an event like this.